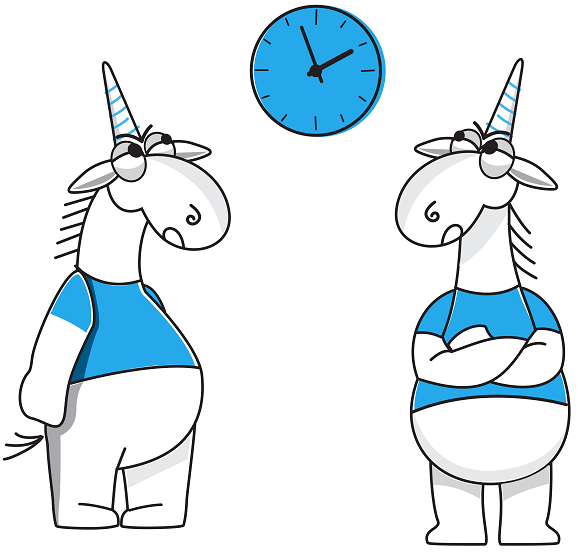 In this article, we invite you to try to find a bug in a very simple function from the GNU Midnight Commander project. Why? For no particular reason. Just for fun. Well, okay, it’s a lie. We actually wanted to show you yet another bug that a human reviewer has a hard time finding and the static code analyzer PVS-Studio can catch without effort. A user sent us an email the other day, asking why he was getting a warning on the function EatWhitespace (see the code below). This question is not as trivial as it might seem. Try to figure out for yourself what’s wrong with this code. As you can see, EatWhitespace is a tiny function; its body is even smaller than the comment on it:). Now, let’s check a few details. The two unicorns below will make sure you don’t accidentally peek at the comment. Well, you see, it’s because we have lied to you about isspace. Bwa-ha-ha! It’s not a standard function at all — it’s a custom macro. Yeah, we’re baddies and we got you confused. With this macro, the authors confused other developers. The code was written under the assumption that isspace is a standard function, which considers carriage return (0×0d, '\r') a whitespace character. The custom macro, in its turn, treats only space and tab characters as whitespace characters. Let’s substitute that macro and see what happens. The function has read some character that’s not a space or tab character. The ('\n' != c) subexpression is not evaluated due to short-circuit evaluation. The loop terminates. We have found that it doesn’t work the desired way. Now let’s see what the implications are. 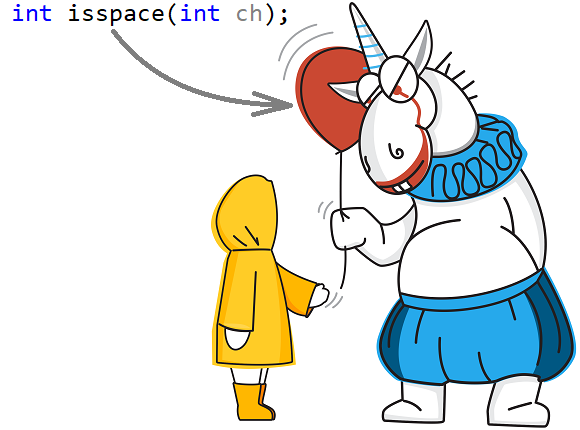 A developer, who wrote the call of isspace in the body of the EatWhitespace function expected that the standard function would be called. That’s why they added the condition preventing the LF character ('\n') from being treated as a whitespace character. What’s more remarkable is that they wanted the carriage return character (0×0d, '\r') to be skipped too. It doesn’t happen though — the loop terminates when encountering this character. The program will end up behaving unexpectedly if newlines are represented by the CR+LF sequence, which is the type used in some non-UNIX systems such as Microsoft Windows. For more details about the historical reasons for using LF or CR+LF as newline characters, see the Wikipedia page «Newline». 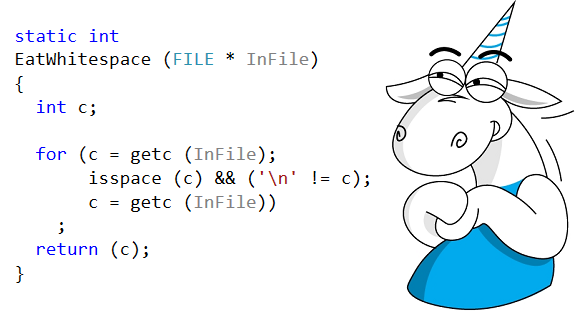 The EatWhitespace function was meant to process files in the same way, whether they used LF or CR+LF as newline characters. But it fails in the case of CR+LF. In other words, if your file is from the Windows world, you’re in trouble:). While this might not be a serious bug, especially considering that GNU Midnight Commander is used in UNIX-like operating systems, where LF (0×0a, '\n') is used as a newline character, trifles like that still tend to lead to annoying problems with compatibility of data prepared on Linux and Windows. What makes this bug interesting is that you are almost sure to overlook it while carrying out standard code review. The specifics of the macro’s implementation are easy to forget, and some project authors may not know them at all. It’s a very vivid example of how static code analysis contributes to code review and other bug detection techniques. Overriding standard functions is a bad practice. By the way, we discussed a similar case of the #define sprintf std: printf macro in the recent article «Appreciate Static Code Analysis». Perhaps the standard isspace function was too slow and the programmer created a faster version, sufficient for their needs. But they still shouldn’t have done it that way. A safer solution would be to define isspace so that you would get non-compilable code, while the desired functionality could be implemented as a macro with a unique name. Thanks for reading. Don’t hesitate to download PVS-Studio and try it with your projects. As a reminder, we now support Java too.